Maria's Stamping Station: Stampin Up Summer Smooches April 2012 Event! 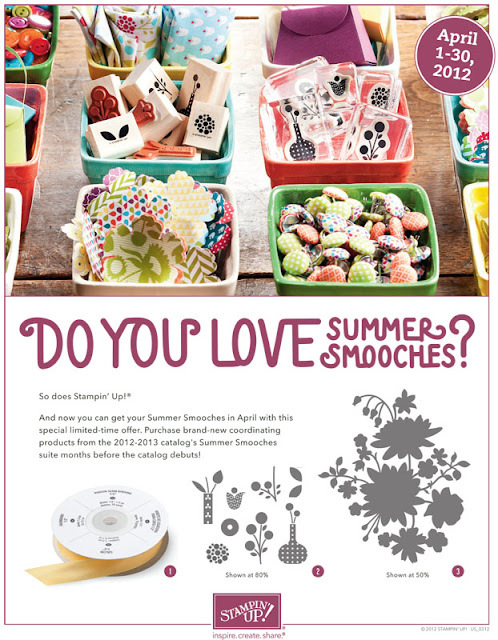 Stampin Up is offering this special limited-time offer during the month of April 2012. You can purchse these great NEW and FRESH products from the upcoming 2012-2013 Catalog now! 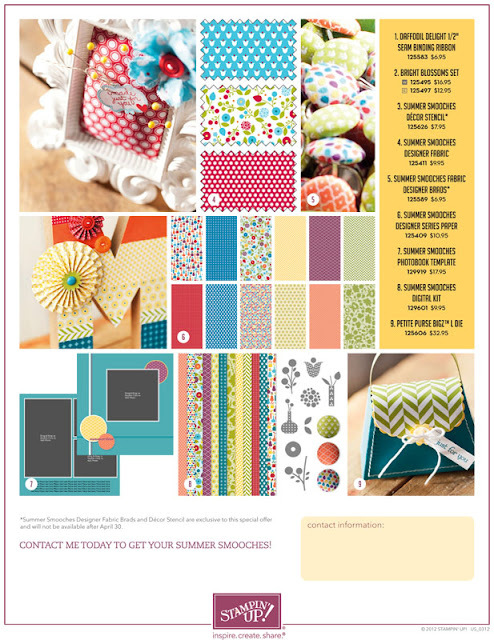 And you get to order some coordinating products this month that won't be available in the upcoming Catalog (the new Catalog will start June 1, 2012)! I don't push you to buy a lot of things, but you will LOVE, LOVE the NEW Petite Purse Bigs Die (#125606) and the NEW Summer Smooches Fabric Brads (#125589) shown below - the brads are one of the items that will not be carried over to the new 2012-2013 Catalog. CLICK HERE TO DOWNLOAD THE PDF FILE..
Next week I'll post a purse sample to show you how cute it is! It's small -it only holds about 4 Hershey Nuggets - but it is so CUTE! It really is great as a party favor for any table. Thanks for visiting and happy Palm Sunday!